Both major feed margin drivers, Milk Solids per Cow and Grass consumed per Hectare, are very close to target. An excellent test of grass growing management is always the next paddock offered to the cows. It is a test of the recent soil moisture, soil nutrients, and grazing management. The next paddock to be grazed at the MDF has an average quantity of 1,000 kg DM available/ha, but it is very patchy. Some patches have a great quantity of feed (1,500 kg DM available/ha, a growth rate of 30 kg DM per hectare per day since previous grazing). However, some patches have very low quantity (500 Kg DM), which is growth rate of only 10 kg DM per day. The grass quality is excellent, mostly leaf, with no high residue of dead material underneath. Soil moisture seems to be a major reason for the poor growth patches in this paddock which is sub-surface-drip irrigated so there is an issue with irrigation efficiency. Soil moisture in the fixed-spray paddocks is very good. This paddock has been rested since previous grazing for 49 days and is consistently at 2.7 leaves regrown, making a leaf appearance average since the previous grazing of 18 days. I suspect most farmers in the district have currently very much shorter grazing rotations than 49 days, so would be far from having three leaves re-grown. In early September, 49 days rest does not grow three leaves at Maffra, never has, never will (unless climate change kicks our typical winter temp up a fair bit). At 49 days (7 weeks) ago, when the first leaf started growing, it was the 23rd of July, and it was cold. 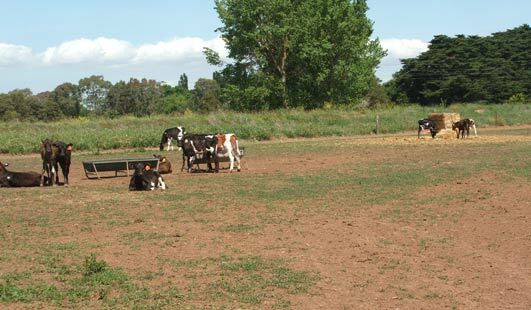 The recently grazed 5 paddocks have averaged 59 days graze rest time. The paddock just grazed has been grazed hard and short between the clumps. The cows would eat more if the right kind of grass was offered, i.e. they are hungry. The clumps are getting a few cm grazed off the top, so have been left too high. A rule of thumb: if a paddock, after grazing, has 50% tall clumps, mow them to 6 cm, so that the cows will have more good grass on offer next time. At the next grazing, the cows will probably not graze in-between-the-clumps so short. It might seem silly topping in early September, but this paddock meets the topping rule-of-thumb. Grass consumed per cow is a useful indicator to watch. If it is high, the cows will be milking well, and the average cost of feed lower.